- Set Net.TCP Port sharing service to Automatic. 1. At EX01, login as Domain Administrator. 2. 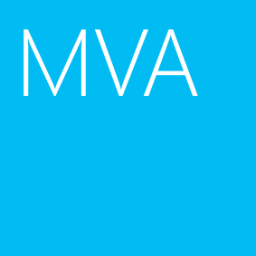 Click "Start > All Programs > Accessories > Windows PowerShell". 4. Install Microsoft Filter Pack. 5. Click "Start > Command Prompt", enter "sc config NetTcpPortSharing start= auto". Remark: NetTcpPortSharing setting is used by Client Access Role only, if you install the other roles services. You don’t need to modify this setting. 1. At EX01, Insert Exchange Server 2010 DVD. 2. 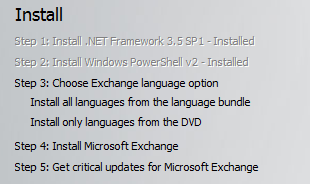 Click "Step 3: Choose Exchange language option > Install only language from the DVD". 3. 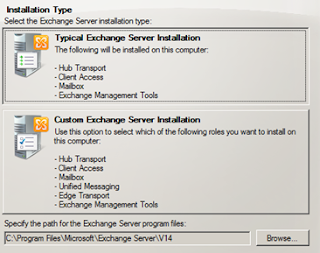 Click "Step 4: Install Microsoft Exchange". 4. At Introduction screen, click "Next". 5. Select "I accept the terms in the license agreement", and then click "Next". 6. Accept the default option "NO" for error reporting and then click "Next". 7. Click "Next" to install with typical installation. 8. Enter you desired organization name e.g. Contoso, and then click "Next". 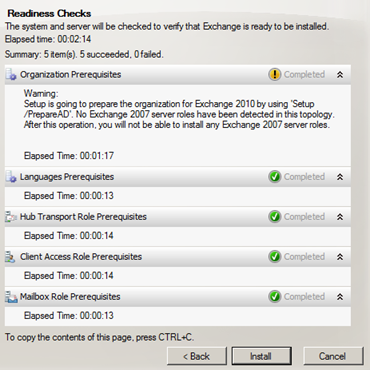 Remark: At Exchange 2003, the organization name for backup usage. 9. At Client Settings, select "NO" and then click "Next" twice. Remark: You can select No now for the installation but add back the support of Outlook 2003 clients later by using the Configure Offline Address Book (OAB) Distribution for Outlook 2003 and earlier clients wizard in Exchange 2010 Console. 10. At Customer Experience Improvement Program, select "I don’t wish to join the program at this time", click "Next". 11. The readiness checks then begin, when the checks finish, click "Install". The installation time needed depends on the hardware configuration of your server. 13. Click "Finish" to complete the installation. 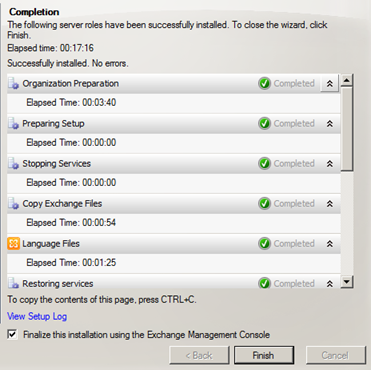 Remark: After insert the cd-key, you have to restart “Microsoft Exchange Information Store” at the services.msc. By default, “Microsoft Exchange Information Store” update every 2 hours. Remark: After installed Exchange 2010 on this forest, you can’t install Exchange 2007.